Kim Hollis: One of the biggest surprises in box office history occurred this past weekend as Borat earned $26.5 million in only 837 venues. How did this happen? Reagen Sulewski: I expected this to do really well on the screens it had, but this was just flabbergasting. This was close to a wide release per screen record. Chalk one up for guerrilla marketing. Joel Corcoran: I think it's a combination of a Sacha Baron Cohen's very strong fanbase, some brilliant marketing, and good timing for the release. Tim Briody: It was marketed perfectly. Even with the limit of clips that could be shown on television, the guerrilla advertising and general nuttiness of it all just clicked with viewers. Joel Corcoran: Though I was completely blown away by the extraordinary totals the movie received. 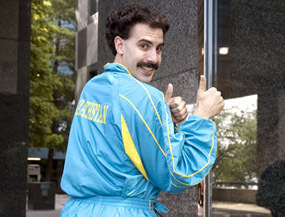 Kim Hollis: Borat was in magazines, on television, on the radio, standing on your front doorstep. It was the perfect storm of buzz. Tim Briody: Well, *now* he has a fanbase, even if nobody could pick the real him out of a lineup since he's always in a character. David Mumpower: Fox is getting assailed for the way they handled Borat's release, but the reality is that they made a savvy business decision. They saw that the film wasn't tracking well in mainstream America. Rather than release it ultra-wide and get empty auditoriums there, they sagely followed the Blair Witch Project release pattern. This was masterful. Joel Corcoran: Cohen has always struck me as having a smaller fan-base, but very dedicated - and I'm one of them. His work as Ali G was just spot-on perfect satirical social commentary. Kim Hollis: Yeah, but I really don't think he had $26.5 million worth of small fan-base. This was something more spectacular than that. David Mumpower: I have never seen an episode of Ali G in Da House, but I did watch Borat opening weekend. The reason was because it looked new and fresh. The promise of a unique movie going experience was tantalizing. Joel Corcoran: Oh, I totally agree, Kim. The marketing drove this movie, but I think the fanbase gave it a good starting point. Please see my movie. If it is not success, I will be execute. Kim Hollis: And truly, the commercials and clips were just hilarious. I hadn't seen a (new) movie in theaters since Talladega Nights, but Borat really piqued my interest. I guess I unconsiously just want to see Sacha Baron Cohen. Reagen Sulewski: This got out to the same people that were huge fans of Jackass. It's a new breed of semi-documentary filmmaking that those demos relate to. It also didn't hurt that it's in the running for best reviewed film of the year. David Mumpower: What I liked about the commercials was the "less is more" theory of showing just a couple of spots. Borat could have seemed overbearing otherwise.